Israeli warplanes carried out dozens of strikes against targets in the Gaza Strip Tuesday, renewing the one-sided, more than month-long war. In the latest round of air strikes, it was reported by the health ministry Tuesday night that a two-year-old child and a woman were killed and 25 others were wounded—most of them women and children—in the bombing of a home in Gaza’s Sheikh Radwan neighborhood. It was reported earlier that two young children were injured in one strike, and three adults in another. Updated figures released by the Gaza Health Ministry revealed that the Palestinian death toll has climbed to over 2,020, including 543 children and 252 women. Israeli fatalities number 67, out of which 64 were soldiers invading the Palestinian territory. Among the targets struck Tuesday night was Hamas’s Al Aqsa radio station, which went silent after the bombing. Meanwhile, UNRWA, the United Nations agency in charge of relief for Palestinian refugees, reported that thousands of people were once again fleeing their homes to seek shelter from the renewed air raids in already overcrowded UN schools. At least 425,000 Gazans have been displaced by Israel’s wholesale destruction of residential neighborhoods. The resumption of the bombing campaign came as talks in Cairo on a long-term cessation of hostilities ground to a halt in the face of Israeli intransigence. The government of Prime Minister Benjamin Netanyahu refused any concessions on core Palestinian demands for the lifting of the seven-year-old blockade that has turned Gaza into the world’s largest open-air prison, starved of essential resources and cut off from the outside world. Israeli spokesmen said that the Israeli airstrikes came in response to the firing of a handful of rockets form Gaza that injured no one and caused no property damage. The Al Jazeera news network said it had confirmed that rockets had been fired from the Shujaiya district, a densely populated neighborhood that was reduced to rubble and was the scene of some of the most intense carnage during the Israeli invasion. “In response to Hamas’s violation of the truce, the prime minister and defense minister have ordered the IDF [Israel Defense Forces] to once more attack terror sites in the Gaza Strip,” a government spokesman said. Tel Aviv announced that the Israeli negotiating team has been ordered to return from Cairo. Palestinian sources said that Palestinian negotiators would leave the Egyptian capital Wednesday. Later Tuesday night, a government official indicated that the Israeli government is preparing to resume all-out war against Gaza and its impoverished population of 1.8 million. “The IDF has been instructed to operate from the air in preparation for a ground operation,” he told the Israeli media. Officials of Hamas, the Islamist movement which leads the Gaza government, however, said that they know nothing about any rocket attacks and suggested that the Israeli government had fabricated the incident in a bid to scuttle the talks and resume its attacks. None of the Palestinian factions in Gaza claimed responsibility for launching any rockets Tuesday. In response to the Israeli strikes, the Qassam Brigades, the armed wing of Hamas, announced late Tuesday night that it had fired rockets at Tel Aviv’s Ben Gurion airport. The renewed conflict came after both sides agreed Monday night to a 24-hour extension of an existing five-day ceasefire in response to a bid by the Egyptian regime of Gen. Abdel Fattah al-Sisi to continue the failing indirect talks between Palestinian and Israeli negotiators. “The negotiations have faced difficulties because of the occupation’s [Israel’s] obstinacy, and the 24-hour [extension] came as a result of a request by mediators to have another chance,” Izzat al-Rishq, a senior Hamas official said. 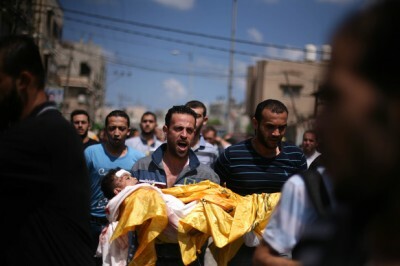 The organization’s spokesman, Sami Abu Zuhri said that Israel was merely “playing for time” in the talks. The Israeli bargaining position reportedly included only an easing of the blockade of Gaza’s borders, which Israel would remain in a position to fully seal off again whenever it saw fit. Tel Aviv refused to discuss Palestinian demands for the opening of a seaport and the restoration of the Gaza airport, which the IDF destroyed during the second Intifada in 2001. As with the question of Palestinian political prisoners, the Israeli negotiators insisted that the discussion of these questions be put off to a later date. The complications apparently involved new Israeli demands for the demilitarization of Gaza, something that Tel Aviv has not been able to accomplish with its armed actions against the territory. The Fatah official may also have been referring to tensions between the Palestinian Administration and Hamas over the ceasefire deal. The deal proposed by the Egyptian mediators would restore substantial power to the Palestinian Authority of President Mahmoud Abbas, who lost control of Gaza to Hamas in 2007. The Palestinian Authority’s security forces, which are US-trained and collaborate closely with Israel, would be placed in charge of the Gaza side of border crossings, while the PA would oversee reconstruction efforts in the territory. The Netanyahu government appeared to be preparing for a resumption of the assault on Gaza even before the breakdown in the talks. Netanyahu declared Monday that the IDF was prepared to take “very aggressive action” if any rockets were fired from Gaza. Netanyahu and Ya’alon came under political fire last week over the Cairo talks from the extreme right-wing Zionist elements in the Israeli cabinet who have voiced support for continuing the Gaza war. Foreign Minister Avigdor Lieberman, having obtained a draft agreement last week from Cairo, charged Netanyahu with attempting to keep its terms secret from the rest of his cabinet. On Friday, Netanyahu said he had not accepted the draft and disavowed its contents, affirming that it failed to meet Israel’s security demands.